Find yourself a world away at Sheraton Grand at Wild Horse Pass, Arizona&apos;s premier Native American-owned luxury resort. 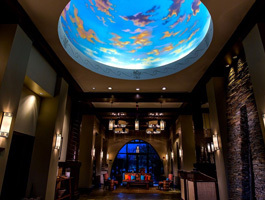 Designed to be an authentic representation of the Gila River Indian Community&apos;s heritage and culture, the architecture, design, art and legends of the Pima (Akimel O&apos;otham) and Maricopa (Pee Posh) tribes are celebrated in every detail throughout the resort. Luxury lovers will enjoy the AAA Four Diamond resort includes Aji Spa, with a private pool and cafe, and the only AAA Five Diamond and Forbes Five Star-awarded restaurant in Arizona, Kai. Families and sports enthusiasts can discover horseback riding at the Koli Equestrian Center, which also offers lessons, the Whirlwind Golf Club and two, 18-hole golf courses, tennis courts, walking trails and Sheraton Adventure Club for younger guests with exclusive Native American cultural programming.